And that's all I'm going to give you of the very chatty blurb -- because after this point we are into serious Spoiler territory. No point in ranting about it in the hope that the publisher might change their ways, though -- Earthlight no longer exists. Suffice to say that after the probe lands, Humanity is left completely altered by the experience and a portion of the survivors emerge with an unswerving drive to respond to the aliens' invitation and build a star vessel capable of reaching them. While others come through the upheaval with a very different agenda, and want nothing more than to try and reclaim normality as best they can. Young charts the lives of her main characters and shows how they are shaped by what befalls them. Of necessity, this book is written in multiple viewpoint and given the span of years and distance she is covering, there are big leaps in the narrative time where the characters have moved on. Despite my strong preference for in-depth characters in first person viewpoint (I), this book gripped me to the end. Young is a highly talented writer with an amazing ability to provide a big emotional wallop to her characters in a relatively small scene. Jude's helpless, desperate love for Valerie, his best friend's wife, is visceral -- which matters as this drives a lot of his motivation through the rest of the story. I also found Varouna absolutely riveting in the early stages of the book -- and would have liked a few more scenes in her viewpoint later in the book near the climax, although I do accept that Young had to make some hard choices in order to keep this book from developing into a sprawling, unwieldy mess, which it never does. In fact, given the epic subject and the scale on which she is operating, the structure is very tightly focused on her viewpoint characters. Through them, we get some fascinating glimpses of how human society has changed after the probe landed, and I have read some readers grumbling that they wanted her to enlarge this aspect of the book. 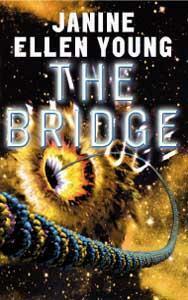 But this book isn't focused on what happens on Earth, it is all about the building of the Bridge. So, does Young succeed in adequately covering her subject and give us a sufficiently complex and plausible experience in this very ambitious novel? In my opinion, yes she does. This is why science fiction really is my favourite genre -- at its best, it poses mind-expanding 'what if' scenarios and then goes on to explore them, weaving contemporary concerns and issues into an entertaining storyline. Young's 'what if' is how our world could unite sufficiently to provide the huge resources necessary to build a deep-space vessel. If you enjoy an intelligently written epic science fiction story peopled with some memorable characters, keep a look out for The Bridge -- it's a cracking read.